We are pleased to offer weekly classes in the Faith Formation Center to our children from First Grade through our junior high Sacrament of Confirmation Preparation Program. Our programs and materials are presented by our volunteer catechists, who so generously share their time, talents, faith, gifts and their love of Church, with our youth. Education in the faith by the parents should begin in the child's earliest years. This already happens when family members help one another to grow in faith by the witness of a Christian life in keeping with the Gospel. Family catechesis precedes, accompanies, and enriches other forms of instruction in the faith. Parents have the mission of teaching their children to pray and to discover their vocation as children of God. The parish is the Eucharistic community and the heart of the liturgical life of Christian families; it is a privileged place for the catechesis of children and parents. Michelle Mascolo, the Coordinator of the Faith Formation Program along with seasoned educators and the priests support the catechists with ongoing training, materials and suggestions of how to best present the materials and meet the learning styles of all our students. Therefore, it is important that parents share with us any special learning, medical and/ behavioral concerns or disability issues that their child may have so that we can do our best to accommodate their child's needs. All student and family records are held in strictest confidence at all times. It is our expectation that all enrolled children attend the scheduled classes, including special liturgies, prayer services and retreats, if applicable. Participating regularly in the Liturgy of the Eucharist (Mass) and the parish Faith Formation Program instills the Catholic faith in a child. It is important for the child to make connections between what they learn at home, in class and at Mass. Parents are expected to attend program level meetings, especially for Sacramental Preparation Programs. Saint Pius X Church offers a welcoming environment for all children who participate in the Faith Formation Program. We strive to complement the family shared experience of love and caring for one another, by bringing God alive in their daily lives. Each child will learn about Catholic teachings, prayers, practices, morals, values, responsibilities and mission helping them grow in their faith and deepen their personal relationship with Jesus. Using a traditional classroom model, our students formally begin in Grade One. Students learn about the Catholic Church and its teachings while developing their faith and personal relationship with God the Father, Jesus the Son, and the workings and guidance of the Holy Spirit within them. As a journey of faith, this is accomplished over time with active participation in the faith community as an integral part. Topics are introduced in developmentally appropriate stages. Key topics include: the learning of traditional prayers; how to use and read the Bible; the Ten Commandments; the Trinity; the Rosary; Prayer- types and styles; Catholic Social-Justice Teachings; Church History; and the Marks of the Church- one, holy, catholic, and apostolic and what it means to be a Catholic Christian in our world today. Intertwined within this program is the Parish Sacramental Preparation Programs for First Reconciliation, First Eucharist and Confirmation. All our programs are in conformity with the guidelines and policies of the Dioceses of Rockville Centre. 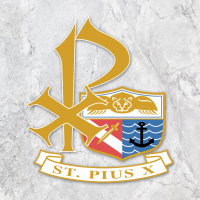 Further, Saint Pius X Church staff and volunteers, who come into regular contact with children, have completed the Virtus program as required by the Diocese of Rockville Centre. We do our best to plan for and accommodate each situation with the given resources and volunteers available to us during any academic year. Every situation is regarded as unique. On occasion we may not be able to give you an immediate solution or placement. When this occurs, the situation will be reviewed and discussed as a team and then again with you before placement is made. An explanation will be given if placement isn't possible at the time. Help is Always Wanted and Needed! Our programs depend upon our volunteers! There are many ways to become involved and we need your help! If you are interested in hearing about being a: Catechist, Substitute Catechist, Classroom Aide, Hall Monitor, or Office Aide, please contact us or complete the volunteer form.